The missal presents texts for the celebration of the Mass. Most of the Mass remains constant throughout the year, but within it are read and sung texts which are unique to each day of the calendar, some of them from the Bible, some special hymns and prayers. This missal was produced in the 14th century for use in Hereford Cathedral. The mass that it presents was meant for a lay congregation as opposed to a monastery. Although by the 14th century much of the Mass was standardised, it could still vary from place to place. 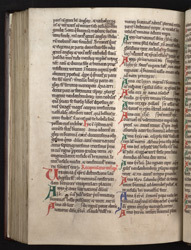 This manuscript can be identified as being of 'Hereford use' by the kinds of texts in it, the way they are arranged, and the saints whose feast days are 'red letter,' that is, written in red. The simple ornament of vines and leaves, drawn in coloured inks, is typical of missals made for everyday use in the later Middle Ages. In the left column of this page can be seen the post-Communion prayer, 'Corpus tuum dne' ('Your body lord...'). Below it, the large decorated initial indicates the beginning of the prayers and readings for Easter. The initial begins the introit, a prayer, usually based on fragments of scriptural text--from a psalm for instance--that would be sung with responses as the priest and attendants processed into the cathedral at the beginning of Mass. Halfway down the left column the reading from the Gospel of Mark begins with the conventional 'In illo t[empore]' ('In that time') 'Maria magdalene & maria jacobi et Salome' (Mark 16:1) .